According to the Centers for Disease Control and Prevention, Cancer is the #2 killer of both females and males, just a few percentage points below Heart disease. One of the most talked about and recognized cancer is Breast Cancer. While not nearly as common or well publicized, men are diagnosed with breast cancer as well. The Susan G. Komen foundation shares the following statistics regarding rates of breast cancer incidence amongst men and woman in 2010 (most recent data available). National Breast Cancer awareness month is coming up in October. There will be an influx of items available in pink. You will even see NFL and other professional athletes sporting pink apparel. Think you are too cool for pink? One of the mom’s on my 14 year old nephew’s football team has breast cancer. Last season, in a show of support, not only for the mom but for their teammate, the entire team purchased bright pink socks to wear at games. I’m glad these teenage boys weren’t too cool for pink. It proves that men like pink too! 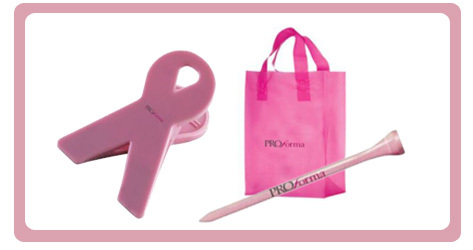 Whether you want to support a man with breast cancer or want to create awareness of breast cancer in general, there are a number of promotional products to create awareness and support the cause. Many organizations also make a donation to the American Cancer Society, Susan G. Komen, or other organizations that contribute to the fight against breast cancer with your purchase. Consider placing an order today or promoting these products with your customer so you are ready to rock pink all through the month of October. Barbara Sulik joined Proforma in June of 2011. Barbara's professional career has centered on Training and Development, Enhancing the User Experience, and the Development of Human Capital through Performance Consulting. She holds a Bachelor's Degree from Eastern Michigan University and a Master's Degree from North Carolina State University. Barbara finished her first Ironman Triathlon in 2014. Beyond swimming, biking, and running, Barbara enjoys yoga, reading, and traveling to new places. Next Article Tips for Healthy Skin in the Summer!